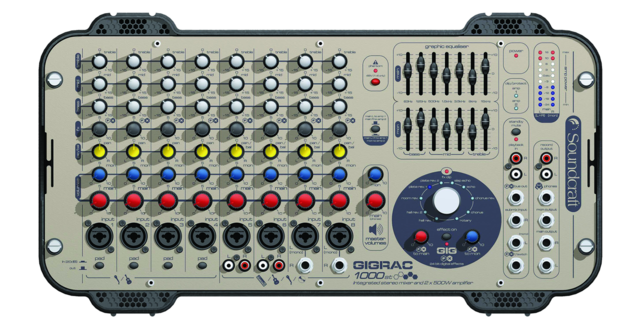 Launched to much acclaim in January 2006, the GigRac family of powered mixers for gigging bands and presentation systems has been joined by the most powerful version yet — the stereo GigRac 1000st, which delivers a massive 1000 watts output power (500 watts per channel into 4 ohms). Dubbed ‘The Box that Rocks’, the new family member has the same cool styling of the GigRac 300 and 600, but is a more powerful full stereo version, featuring expanded 3-band EQ on the inputs, two 7-band graphic equalisers and 10 high-quality preset digital effects. The 1000st is slightly higher than its brothers at 5U (8.75 inches/223mm) but still this tiny package delivers awesome power and performance, with the ability to be slung over your shoulder. As with the GigRac 300 and 600 models, there are two output signal paths, one for the main front-of-house output and one for stage monitors. In normal stereo use, the two power amps deliver a full 500W of power (@ 4 ohms) to the Main (FOH) output, but the 1000st can be switched to provide 500 watts to the Main output and 500 watts to the Monitor outputs. Other additional features include pan controls for the inputs to the stereo bus, a stereo graphic EQ on the main output and a 7-band mono graphic EQ on the monitor output, 12-segment bar graph meters for both Main and Monitor outputs, a stereo playback input (for CD playback, for example) and a stereo submix input. In standby mode all channels are muted until the band is ready to play, while the playback input remains active for interval music. Don’t worry about the weight, however, as the 1000st features a lightweight switched-mode PSU, derived from years of successful switched-mode design at Soundcraft and BSS. The GigRac 1000st forms a perfect PA setup when combined with JBL’s new JRX speakers and JRX118SP powered sub.